Emperor Go-En'yū (後円融天皇, Go-En'yū-tennō) (11 January 1359 – 6 June 1393) was the "5th" of the Ashikaga Pretenders during the period of two courts in Japan. According to pre-Meiji scholars, his reign spanned the years from 1371 through 1382. This Nanboku-chō "sovereign" was named after the 10th century Emperor En'yū and go- (後), translates literally as "later;" and thus, he may be called the "Later Emperor En'yū", or, in some older sources, may be identified as "Emperor En'yū, the second", or as "Emperor En'yū II." His personal name was Ohito (緒仁). 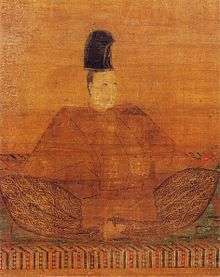 He was the second son of the fourth Northern Pretender Emperor Go-Kōgon. His mother was Fujiwara no Nakako (藤原仲子), daughter of Hirohashi Kanetsuna (広橋兼綱). In his own lifetime, Go-En'yū and those around him believed that he occupied the Chrysanthemum Throne from 9 April 1371 to 24 May 1382. In 1371, by Imperial Proclamation, he received the rank of shinnō (親王), or Imperial Prince (and potential heir). Immediately afterwards, he became emperor upon the abdication of his father, Emperor Go-Kōgon. There was said to be a disagreement between Go-Kōgon and the retired Northern Emperor Emperor Sukō over the Crown Prince. With the support of Hosokawa Yoriyuki, who controlled the Bakufu, Go-Kōgon's son became the Northern Emperor. Until 1374, Go-Kōgon ruled as cloistered emperor. In 1368, Ashikaga Yoshimitsu was named Shōgun, and with his guardianship, the Imperial Court was stabilized. 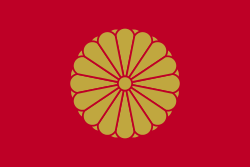 In 1382, upon abdicating to Emperor Go-Komatsu, his cloistered rule began. Having no actual power, he rebelled, attempting suicide and accusing Ashikaga Yoshimitsu and his consort Itsuko of adultery. In 1392, peace with the Southern Court being concluded, the Period of the Northern and Southern Courts came to an end. On 6 June 1393, Go-En'yū died. He is enshrined with other emperors at the imperial tomb called Fukakusa no kita no misasagi (深草北陵) in Fushimi-ku, Kyoto. The years of Go-En'yū's Nanboku-chō reign are more specifically identified by more than one era name or nengō. ↑ Titsingh, Isaac. (1834). Annales des empereurs du japon, pp. 310–316.